PENSACOLA, Fla. - Feb. 10, 2017 - PRLog -- Parents and educators, engage and entertain your preschoolers by exploring the concepts of counting and using numbers as symbols through this fun, rhyming picture book. 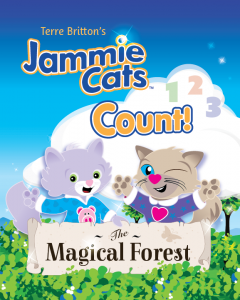 Be sure to watch for more Jammie Cats adventures, and visit their site for free downloads: coloring pages, games, masks, and more. Terre Britton is embracing her third decade in the design industry as an illustrator, graphic designer, writer, and fine artist. She holds a degree in History in Art with a minor in English and has written art reviews for Regional News and Victoria News, Victoria BC. Britton has won Best of Show at Artel Gallery, Pensacola, FL, where she also held a solo painting exhibition and her work, Gala One, was added to the prestigious Cinco Banderas Permanent Collection. Interview with American Thriller/Mystery writer Al Boudreau, on "Author's Dialogue"
Interview with American Thriller/Mystery Writer Tom Drinkard, on "Author's Dialogue"
Interview with Canadian Pulp Fiction, Manga & Fantasy writer Calvin Daniels, on "Author's Dialogue"
Interview with Australian Crime Fiction Novelist Carole Sutton, on "Author's Dialogue"
Interview with American Cowboy Poet Dale E. Page on "Author's Dialogue"